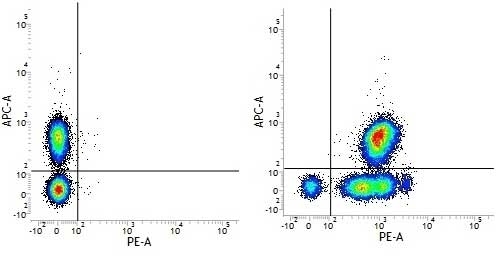 Figure A. APC conjugated Mouse anti Human CD3 (MCA463APC) and RPE conjugated Mouse IgG1 isotype control (MCA928PE). Figure B. APC conjugated Mouse anti Human CD3 (MCA463APC) and RPE conjugated Mouse anti Human CD46 (MCA2113PE). All experiments performed on human Peripheral blood lymphocytes in the presence of human SeroBlock (BUF070A). Mouse anti Human CD46 antibody, clone MEM-258 (MCA2113) used for blocking adenovirus attachment to cells in vitro in blocking experiments on smoooth muscle and endothelial cells. In vitro virus transduction. β-Gal activity and representative images of X-gal stained cells in A. HSVSMC and B. HSVEC infected with 5000 vp/cell for 3 hours at 37°C. β-Gal activity was normalised to total protein levels (* = p <0.05 compared to Ad5, *** = p <0.001 compared to Ad5). β-Gal activity normalised to total protein in (C) HSVSMC and (D) HSVEC infected with 5000 vp/cell in the presence or absence of CD46 function-blocking antibody MEM258 or an isotype matched control. (* = p <0.05 relative to isotype control, ** = p <0.01 relative to isotype control). From: White KM, Alba R, Parker AL, Wright AF, Bradshaw AC, Delles C, McDonald RA,Baker AH. Assessment of a novel, capsid-modified adenovirus with an improved vascular gene transfer profile. J Cardiothorac Surg. 2013 Aug 9;8:183. Muse ati HumanCD46 antibody, clone MEM-258 (MCA2113) used for the evaluation of CD46 expression on human cell lines by flow cytometry. Detection of CD46, HSPG, CD80, and CD86 surface expression on HeLa, A549, K562, and Ramos cells. Overlays of representative flow cytometry charts are shown. Role of Cellular Heparan Sulfate Proteoglycans in Infection of Human Adenovirus Serotype 3 and 35. Mouse anti Human CD46 antibody, clone MEM-258 recognizes the human CD46 cell surface antigen, a broadly expressed glycoprotein also known as membrane co-factor protein (MCP). CD46 functions as an inhibitor of complement activation limiting the formation and activity of C3 convertases. CD46 is expressed by all nucleated cells, often as multiple isoforms on the same cells. The molecule is also expressed by sperm and may be important in the process of fertilisation. Sirena D et al. (2004) The human membrane cofactor CD46 is a receptor for species B adenovirus serotype 3. J Virol. 78 (9): 4454-62. Fremeaux-Bacchi, V. et al. (2006) Genetic and functional analyses of membrane cofactor protein (CD46) mutations in atypical hemolytic uremic syndrome. J Am Soc Nephrol. 17 (7): 2017-25. Fleischli, C. et al. 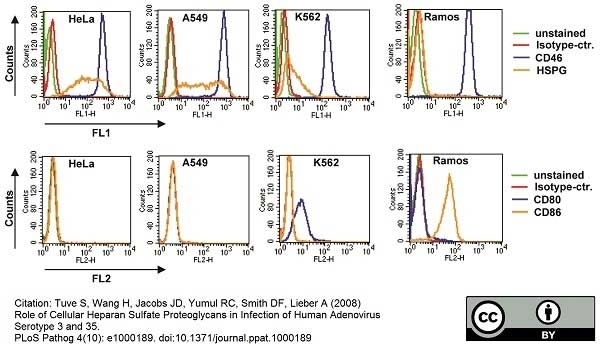 (2005) The distal short consensus repeats 1 and 2 of the membrane cofactor protein CD46 and their distance from the cell membrane determine productive entry of species B adenovirus serotype 35. Sweigard, J.H. et al. (2010) Adenovirus vectors targeting distinct cell types in the retina. Invest Ophthalmol Vis Sci. 51:2219-28. Bahat, A. and Eisenbach, M. (2010) Human sperm thermotaxis is mediated by phospholipase C and inositol trisphosphate receptor Ca2+ channel. Bienaime, F. et al. (2010) Mutations in components of complement influence the outcome of Factor I-associated atypical hemolytic uremic syndrome. Wang, H. et al. (2008) In vitro and in vivo properties of adenovirus vectors with increased affinity to CD46. Hara, H. et al. (2011) Initial in vitro investigation of the human immune response to corneal cells from genetically engineered pigs. Invest Ophthalmol Vis Sci. 52: 5278-86. El Karoui, K. et al. (2012) A clinicopathologic study of thrombotic microangiopathy in IgA nephropathy. J Am Soc Nephrol. 23 (1): 137-48. Bach, P. et al. (2013) Specific elimination of CD133+ tumor cells with targeted oncolytic measles virus. Cancer Res. 73 (2): 865-74. Leaderer, D. et al. 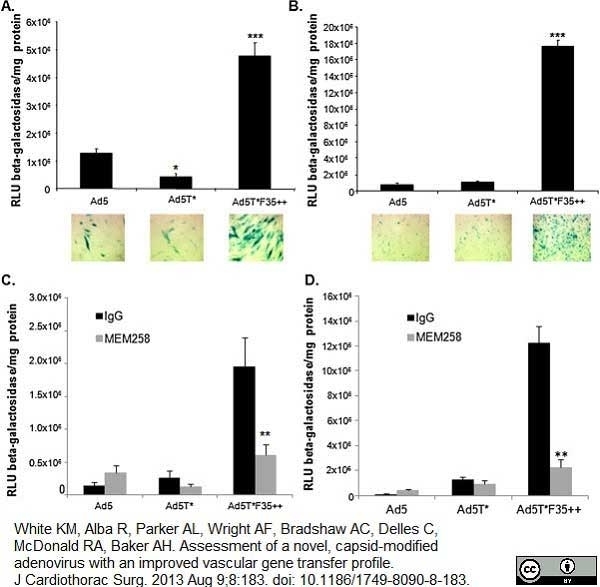 (2015) Adeno-associated virus mediated delivery of an engineered protein that combines the complement inhibitory properties of CD46, CD55 and CD59. J Gene Med. 17 (6-7): 101-15. Tuve, S. et al. (2006) A new group B adenovirus receptor is expressed at high levels on human stem and tumor cells. J Virol. 80 (24): 12109-20. Hara, H. et al. (2008) In vitro investigation of pig cells for resistance to human antibody-mediated rejection. Transpl Int. 21 (12): 1163-74. Loré, K. et al. (2007) Myeloid and plasmacytoid dendritic cells are susceptible to recombinant adenovirus vectors and stimulate polyfunctional memory T cell responses. J Immunol. 179 (3): 1721-9. Fremeaux-Bacchi, V. et al. (2007) Unusual clinical severity of complement membrane cofactor protein-associated hemolytic-uremic syndrome and uniparental isodisomy. Am J Kidney Dis. 49 (2): 323-9. Le Quintrec, M. et al. (2008) Complement mutation-associated de novo thrombotic microangiopathy following kidney transplantation. Am J Transplant. 8 (8): 1694-701. Boyer, O. et al. (2008) Complement factor H deficiency and posttransplantation glomerulonephritis with isolated C3 deposits. Am J Kidney Dis. 51 (4): 671-7. Wang, H. et al. (2009) Receptor usage of a newly emergent adenovirus type 14. Iguchi, K. et al. (2012) Efficient antitumor effects of carrier cells loaded with a fiber-substituted conditionally replicating adenovirus on CAR-negative tumor cells. Cancer Gene Ther. 19 (2): 118-25. Kälin, S. et al. (2010) Macropinocytotic uptake and infection of human epithelial cells with species B2 adenovirus type 35. J Virol. 84 (10): 5336-50. Bottino, R. et al. (2014) Pig-to-monkey islet xenotransplantation using multi-transgenic pigs. Am J Transplant. 14 (10): 2275-87. White, K.M. et al. (2013) Assessment of a novel, capsid-modified adenovirus with an improved vascular gene transfer profile. J Cardiothorac Surg. 8: 183. Tuve, S. et al. (2008) Role of cellular heparan sulfate proteoglycans in infection of human adenovirus serotype 3 and 35. PLoS Pathog. 4 (10): e1000189. Iwase, H. et al. (2014) Regulation of human platelet aggregation by genetically modified pig endothelial cells and thrombin inhibition. Sweigard, J.H. et al. (2011) Adenovirus-mediated delivery of CD46 attenuates the alternative complement pathway on RPE: implications for age-related macular degeneration. Gene Ther. 18 (6): 613-21.